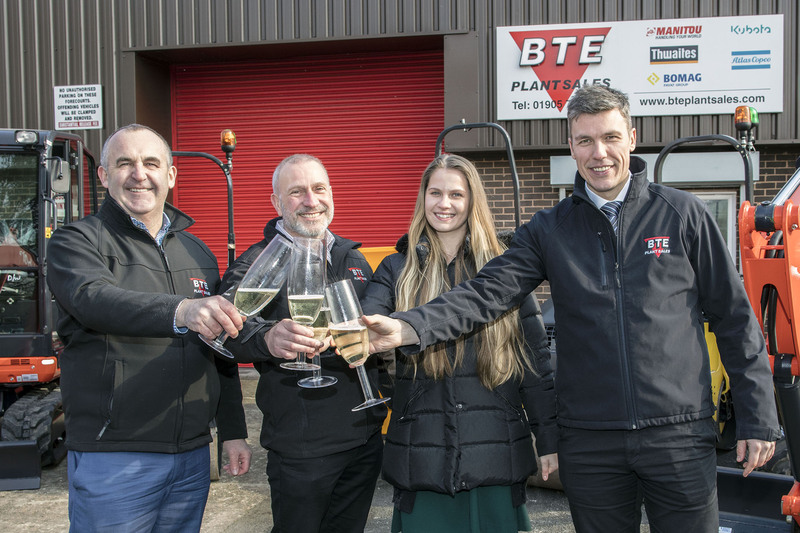 BTE Plant Sales Ltd opened their fourth depot in Droitwich on the day record sales announced. The large, mod­ern facil­i­ty is locat­ed just min­utes from the M42 and M5 motor­ways. BTE rep­re­sent lead­ing orig­i­nal equip­ment man­u­fac­tur­ers across a large ter­ri­to­ry which cov­ers the North and Cen­tral UK. The new depot will serve a wide range of cus­tomers in the West Mid­lands, Shrop­shire, Worces­ter­shire and Here­ford­shire and joins the exist­ing depots in Ley­land, Leeds and BTE’s Head Office in Mark­field Leices­ter­shire. All 4 depots are ful­ly oper­a­tional pro­vid­ing sales, ser­vice and gen­uine parts sup­port for cus­tomers across the ter­ri­to­ry. Found­ed in 1990 by Ben Elliott, BTE has grown through­out its 28-year his­to­ry with a strong rep­u­ta­tion for excel­lent cus­tomer ser­vice. BTE now rep­re­sents sev­er­al of the lead­ing con­struc­tion equip­ment man­u­fac­tur­ers, all experts and lead­ers in their field. 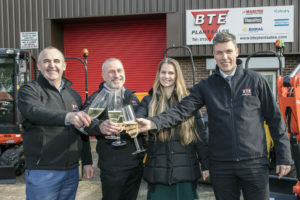 BTE brands include British built Thwait­es site-dumpers, mar­ket lead­ing Kub­o­ta mini-exca­va­tors, Man­i­tou mate­ri­als han­dling equip­ment, BOMAG com­paction equip­ment, Atlas Cop­co com­pres­sors and Epiroc hydraulic attach­ments. BTE cus­tomers include util­i­ty con­trac­tors, local author­i­ties, civ­il engi­neers, house­builders and the all-impor­tant rental (plant-hire) sec­tor. Con­struc­tion equip­ment leads a tough life and even the best machines need reg­u­lar ser­vic­ing and main­te­nance. All four BTE depots hold stock of gen­uine parts and run a fleet of ser­vice vehi­cles, equipped with the lat­est diag­nos­tic equip­ment, manned by expe­ri­enced ‘fac­to­ry trained engi­neers’ who pro­vide on-site sup­port to BTE cus­tomers through­out the ter­ri­to­ry. This is a time­ly move as despite expe­ri­enc­ing three con­sec­u­tive quar­ter­ly declines, con­struc­tion out­put in Great Britain grew by 5.1% in 2017 due to strong growth at the end of 2016 and in Quar­ter 1 2017. Con­struc­tion out­put is fore­cast to grow in 2018 and the gov­ern­ment has set a house­build­ing tar­get of 300,000 homes each year over the medi­um term. The West Mid­lands is still a major eco­nom­ic area with indus­tri­al rede­vel­op­ment con­tin­u­ing, house­build­ing on the increase* and major projects like HS2** hap­pen­ing in the com­ing months.